Lieutenant Governor Stack, Speaker Turzai, President Scarnati. . .
Leader Corman, Leader Costa, Leader Reed, Leader Dermody. . .
Members of the General Assembly, invited guests, friends and family. . . I have always believed in the potential of our great Commonwealth. Pennsylvania is where I grew up. It’s where Frances and I raised two wonderful daughters. It’s where I signed the backs of paychecks as a forklift operator – and where I signed the fronts of paychecks after I bought the family business. Pennsylvania should be a place where anyone who wants a good job can find one. . . a place where businesses large and small can grow and thrive. . . a place where every family can pass on greater opportunities to the next generation. When I first ran for Governor, I met so many Pennsylvanians who believed in our potential, too. Even if they, themselves, were hurting, struggling to get back on their feet in the wake of the Great Recession, they loved our Commonwealth, and they believed that a brighter future was possible here. But they felt like Harrisburg wasn’t doing its part to help build that brighter future. And they were right. That’s why I promised to be a different kind of governor who would bring a different approach – because I knew that we couldn’t keep doing things the same old way here in Harrisburg and expect different results. Over the last two years, we’ve begun to make progress. And, even better, we’ve been able to make progress together. We came together to pass a historic liquor reform bill. I didn’t do that. We did that. We came together to bring relief to suffering children by passing medical marijuana, something people in this building have been fighting for since long before I got here. I didn’t do that. We did that. Today, Pennsylvania’s schools are beginning to recover from years of chronic underfunding. We’ve taken a new, more aggressive, more effective approach to fighting back against the heroin and opioid epidemic ravaging our communities. And, I’m proud to say, there are 82,000 more Pennsylvanians working than there were two years ago. I didn’t do that. We did that. But there’s still work to be done to help Pennsylvanians build a brighter future. And, yes, there’s still work to be done when it comes to making Harrisburg work better for the people it serves. And there’s no better example than the issue at hand today: our state budget. Our Commonwealth has been operating with a structural deficit for a long time. That means Harrisburg has been living beyond its means. Households can’t do that, and neither can we. Harrisburg’s past failure to address that deficit led to devastating cuts in education, made our senior citizens more vulnerable, and prevented our economy from reaching its full potential. To Pennsylvanians, it seemed like the budget always brought out the worst in Harrisburg. Politicians always found a way to avoid making the tough decisions. Special interests always found a way to avoid giving up their special privileges. And taxpayers always wound-up holding the bag, forced to choose between paying higher taxes or settling for worse services. Harrisburg’s inability to solve these problems responsibly put our education system, our economy, and our families at risk. Pennsylvanians deserve better—and we must continue to deliver for them. As Governor, I’ve pushed for a different approach, one that puts schools and seniors first, because I believe that, if we’re going to help Pennsylvania fulfill its potential, we can’t go back to forcing our children and our parents to pay the price for Harrisburg’s failures. Nor can we go back to the practices that created this problem in the first place. Nor, for that matter, can we go back to saddling Pennsylvania families working hard to get by with the bill for a mess they didn’t make. So, I’m offering a budget proposal that represents a responsible solution to our deficit challenge – and a different approach from the way things have been done in Harrisburg for almost a generation. Let’s start here: In my proposed budget, there are no broad-based tax increases. At the same time, my budget protects the investments we’ve made in education, in senior services, in fighting the scourge of opioids, and in growing Pennsylvania’s economy. And it sets our Commonwealth on a sustainable fiscal course that will grow our paltry rainy day fund from $245,000 today to almost $500 million by 2022. How? By reforming our state government – and by making Harrisburg work smarter. One of my first acts as Governor – two years ago – was to identify $150 million we could save by making our state government more efficient – everything from negotiating for lower prices from vendors to putting voter registration online to streamlining the process for outgoing mail. This budget goes even further. In fact, it contains the largest cuts to, and consolidations of, government bureaucracy in our history. Some of these reforms are simply long overdue common sense measures – like centralizing shared services like human resources and information technology, selling property the state owns but doesn’t use, or consolidating pension funds to save millions that used to flow into the pockets of too many Wall Street financial managers. Some of these reforms reflect new thinking on how we can cut costs without reducing the level of service we provide to Pennsylvanians – like merging departments under one roof, or offering a new early retirement program to modernize our state workforce. And, yes, some of these reforms involve gritting our teeth and tightening our belts – like eliminating funding for bureaucratic positions that are currently vacant. But streamlining our state government doesn’t mean reducing the services it provides. In fact, it can improve services. For example, my proposal streamlines the various programs designed to help small businesses get off the ground by creating a single point of contact to help small business owners cut through red tape and start creating jobs. By identifying specific programs that could be working more efficiently – and others that are no longer working at all – this budget proposes reforms that, altogether, will save taxpayers more than $2 billion. That’s money we can use not only to protect the funding we’ve restored for education, but to provide more options for seniors so they can stay in their homes while receiving the care they need, make new job-creating investments in manufacturing and workforce development, and help communities ravaged by heroin and opioid abuse. This proposal also closes corporate loopholes that have helped big companies avoid paying their fair share. Look, I have nothing against successful businesses. I used to run one. But Pennsylvania families are already paying too much to help fund our government. And when big corporations get special treatment, Pennsylvania families and small businesses wind up shouldering more of a burden than they can bear. That’s why I’ve fought to close these loopholes from the beginning. Today, and in the days and weeks to come, we’ll have a chance to sit down and discuss this budget in depth. But I believe that any debate about budgets is, at its core, really a debate about priorities. And the budget I’ve proposed reflects my belief that there should be no greater priority for our government than educating our children. After all, if you ask Pennsylvanians about their top priority, the odds are that, if they’re parents or grandparents, they’ll start by telling you about their kids, or their grandkids. I’m honored beyond words to serve as Pennsylvania’s Governor, but the most important job I have ever had is being Sarah and Katie’s father. And I know the same is true for everyone in this chamber who has had the incredible fortune to be a parent. There isn’t a single one of you – not one Republican, not one Democrat – who wouldn’t do anything for your kids. Frances and I sent our girls to public schools in York County. There, we watched them grow and learn and discover who they were, thanks in no small part to some incredible teachers. We watched them earn the opportunity to go off to college. We watched them build careers of their own – Sarah as an architect, and Katie as a geologist. So when, five years ago, our state government cut a billion dollars from public education, we – like so many parents all across Pennsylvania – were horrified. Teachers were being laid off by the hundreds, schools were pushed to the brink of closing, and the same education system that had given my kids so much opportunity was being set up by Harrisburg to fail. As I traveled the state, I found that I wasn’t alone in that fear. I met brilliant students who were being held back because their schools didn’t have enough textbooks – heck, some schools I visited couldn’t even afford enough toilet paper. I met parents who worried that the school buildings they sent their kids off to every day weren’t safe. I met teachers who were being asked to do more and more with less and less – and then being told they were overpaid. Over the past two years, we’ve taken a different approach. Instead of allowing schools to become the first casualty of our budget deficit, we’ve made them our first priority. We’ve undone nearly two-thirds of those short-sighted cuts to our public school system. In fact, we’ve made the largest investment in education in the history of the Commonwealth. Struggling schools in places like Chester, and Wilkinsburg, and right here in Harrisburg are back on stable financial footing. Parents and teachers no longer have to spend their summers worrying about whether the school doors will open in September. And when I travel the state now, I visit more and more school districts where, instead of scrambling to make ends meet, they’re expanding the programs available to students – and expanding the opportunities these students will have once they graduate. For example, in the Dover Area School District, they’ve created more Career and Technical Education programs ranging from Agriculture to Accounting to Geospatial Technology. More than 200 students are now enrolled in these programs, many of them earning college credits while still in high school thanks to partnerships with post-secondary institutions. And they’ve done it without raising local taxes one dime. And in the Jersey Shore Area School District, they’ve used new funding to further develop their Learning Pathways Curriculum, which helps prepare high school students for careers in business, human services, and industrial technology. Next up will be an expanded Health Science program. Meanwhile, in Mifflintown, the Juniata County School District was just named to the College Board’s AP District Honor Roll for expanding access to advanced placement courses and tests while maintaining student achievement. It’s one of 44 districts across the Commonwealth to earn that distinction. Our renewed commitment to Pennsylvania schools has included $465 million in restored funding for K-12 education, $14.6 million for early intervention, and $81.4 million for higher education. We’ve restored $60 million in funding for early childhood education, and now nearly 200 school districts across the Commonwealth are planning to make new investments in pre-K or kindergarten, giving thousands of our youngest Pennsylvanians a boost as they embark on a lifetime of learning. We haven’t solved every problem in our education system. But I’m proud to say that the investment we’ve worked together to make in Pennsylvania’s future is already beginning to pay off. In this budget, I’m proposing $125 million for K through 12 classrooms, $75 million to expand high-quality early childhood education, and $8.9 million for our state system of higher education. Just as Pennsylvanians make their children a top priority, so, too, are aging parents, aunts and uncles a top priority for all of us. When I was running for this office, I listened to seniors all across our Commonwealth. They told me that they very much appreciated how often politicians came to see them, but that they’d prefer real action on improving senior services. That’s why one of the first initiatives I announced as Governor was to improve home-based and community-based care services, so that more seniors could have more options for getting the care they needed without having to move out of their homes. And it’s why, when health insurers threatened to kick 180,000 seniors off their health plans, we stepped in and took those insurance companies to court to make sure that their coverage stayed in place. Just this past year, the Department of Aging distributed more than $2 million in lottery proceeds to 43 senior community centers across our Commonwealth. And we made it easier for struggling seniors to get assistance purchasing nutritious food. There’s more to be done. Next January, another new program called Community HealthChoices will come online to help more seniors receive the care they need within their community instead of at facilities. But innovations like these are only possible if we continue to move past the budget battles that have paralyzed Harrisburg for far too long and take a different approach. And there’s no better illustration of that different approach than the steps we’ve taken together to address the public health crisis of heroin and opioid abuse. This epidemic has stolen the futures of far too many of our fellow Pennsylvanians. The numbers are simply staggering. But, for me, and I suspect for many of you, the numbers aren’t what compelled us to act. It was the stories. It was the people. Like, the woman who had been through eight treatment facilities by the age of 20 but who still struggles with addiction everyday. The dad who broke down in tears begging for help for his daughter. The cop who’s arrived on the scene too late to help the latest victim. I remember being in a doctor’s office when the physician’s assistant came in and closed the door. “You’ve got to do something,” she told me. She’d seen too many people suffering the effects of an opioid addiction. And then she told me her own brother had died of a heroin overdose just a few weeks earlier, at the age of 39. There’s not one of us in this chamber who hasn’t been shaken to our core after hearing from a constituent who had to identify a loved one at the morgue or bury a childhood friend. And so, we worked together to take action. We armed law enforcement with the tools they need to crack down on those who profit from this crisis by preying on our most vulnerable citizens. And we equipped police and first responders with naloxone, a life-saving opioid overdose antidote, allowing them to reverse more than 2,300 opioid overdoses so far. We destroyed more than 100,000 pounds of unused and unwanted prescription drugs before they could fall into the wrong hands, and we redesigned the Prescription Drug Monitoring Program so that medical professionals can monitor patients and identify those who may be at risk. We’ve taken our campaign against opioids from classrooms to emergency rooms to correctional facilities – and we’ve devoted more than $20 million to expanding treatment options, creating 45 Centers of Excellence throughout the state and giving nearly 11,000 Pennsylvanians a chance to escape addiction. And when we took action to expand Medicaid, providing more than 700,000 Pennsylvanians with access to health care, we empowered more than 120,000 people currently battling addiction to get the help they need – which is why I’m going to fight to keep those protections in place. I pledge to continue doing everything in my power to keep protecting our communities from the scourge of heroin and opioid abuse. And I know that I, and all of Pennsylvania, can count on everyone in this chamber to stand together. I still believe in the potential of our Commonwealth. And I’m proud of the progress we’ve begun to make to fulfill that potential. Now, the kind of change I’m trying to bring to Harrisburg won’t come easy. If reforming our state government and putting Pennsylvania back on a path to fiscal stability were easy, these things would have been done long ago. And I can’t do it alone. That’s why we’ve reached out to legislators on both sides of the aisle and incorporated their ideas for cutting spending and eliminating wasteful inefficiencies. And it’s why I’m ready to work with anyone in this chamber to pass a budget that addresses this challenge responsibly and protects the priorities that matter to Pennsylvanians. The truth is, the people of the Commonwealth have elected a Democratic Governor and the most Republican legislature in modern history. I think it’s safe to say that they don’t expect us to agree on everything. But no Pennsylvanian is interested in more of the same here in Harrisburg. Nobody wants to see us argue over who should get the credit for solving problems – and if we don’t solve problems, no Pennsylvanian will be interested in watching us argue over who should get the blame. The people who put us here want to see progress. They deserve to see progress. And when we’ve worked together, we’ve been able to deliver that progress. Sure, over the two years I’ve been in this job, we’ve had our share of disagreements, some of them fierce. But we’ve also proven that, when Pennsylvanians demand action, we are capable of coming together to answer the call. Over the last two years, we’ve decreased our prison population, we’ve begun to rebuild our crumbling roads and bridges, and we’ve brought some much-needed transparency and accountability to Harrisburg, just to name a few. And there are more Pennsylvanians working today than there were just two years ago. Yes, we’ve seen what Harrisburg looks like at its worst. But we’ve also seen what’s possible when we set aside those tired old fights and make Pennsylvanians’ priorities our priorities. I believe that we can leave the frustrating politics of old behind us and work together to build a brighter future for all Pennsylvanians. And it is in that spirit that I invite this legislature to join me in turning the page on the broken politics that have held our Commonwealth back, and choose a different path forward, one in which Democrats and Republicans work together to re-imagine and re-invent our state government. . . re-commit to our schools, to our seniors, and to our most vulnerable citizens. . . and rebuild our middle class. I’m ready to get to work. And I hope you are, too. Thank you. God bless you. And God bless the Commonwealth of Pennsylvania. 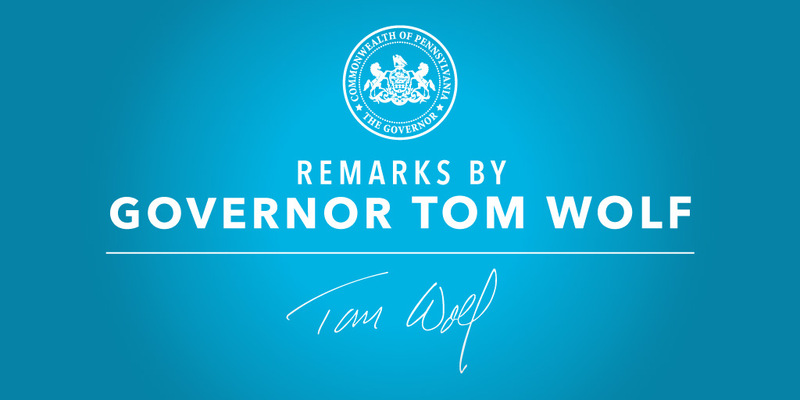 Read more posts about Governor Wolf’s 2017-18 budget.